Camp starts August 5th and ends August 10th in Oliver B.C and is designed for players born in ’08 to ’09 and will be played on a 60’/46′ diamond. Campers will work on individual skill development throughout the week as well as being divided into teams to compete in Baseball specific competitions and Tournament play. 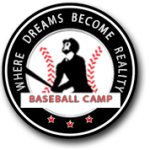 The cost ($695 + GST) of this summer baseball camp/tournament, includes BLE camp hat/shirts/shorts, coaching instruction and supervision. The camp facilities include a number of well manicured fields and batting cages. The players are housed in the Oliver Arena adjacent to the baseball diamonds and community swimming pool that is used by the players during the week. Players are served nutritious and plentiful meals by a certified chef and a snack bar is available twice a day! Camp check in is between 2:00 and 4:00 pm on Day 1 of camp and the players are dismissed on the Final day of camp at approximately 12pm. Please note that some teams may still be involved in tournament play as late as 2:00 pm. Parents are encouraged to watch games during the week or enjoy the surrounding area and what it has to offer. *if paying by check or e-transfer with the invoice method, you can save the electronic processing fees of $20. Your credit card will not be charged, then submit 2 checks to the BLE office, 1 for the deposit ( $157.50 inc GST dated the day of your registration ) and 1 for the balance remaining ( dated no later then 30 days prior to your camp start date ) deduct $20.00 from the balance amount. If you are using a promo code for a camp scholarship, please note that the code is only usable one time for the scholarship winner, any subsequent use of the promo code by others, will void that promo code for all persons that use it.